ATA’s Certification Exam Preparation Workshop presented opportunities for participants to learn how the Certification Program works, including the general characteristics of exam passages and how exams are evaluated and graded. 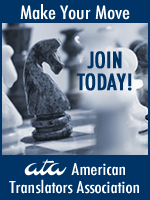 ATA held a Certification Exam Preparation Workshop on January 20 at the University of Massachusetts Boston. 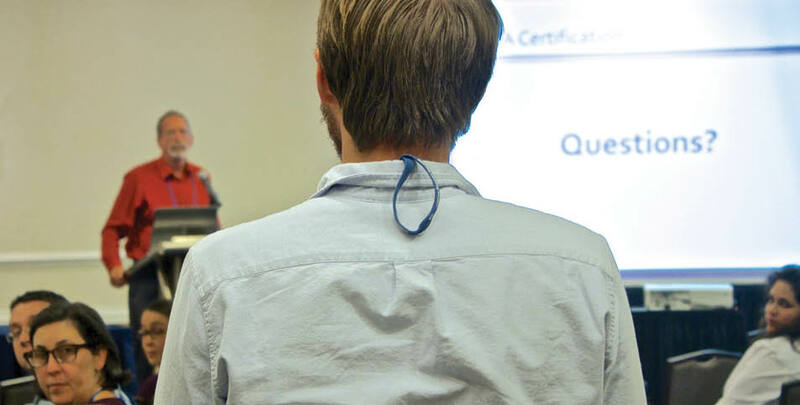 Training has always been an important part of ATA’s mission, and organizers wanted to see if a full-day workshop led by graders of ATA’s Certification Program could successfully benefit both exam candidates and the program. The workshop consisted of two sessions designed to help participants understand how the exam is graded and the common errors candidates make. The morning session was for those interested in taking the exam from English into Spanish, while the afternoon session focused on those interested in taking the exam from any language into English. The two of us (Rudy and Diego) were in charge of the English>Spanish session (aside from grading, we work in the English>Spanish workgroup in ATA’s Certification Program). The other two graders, Bruce Popp and Andy Klatt (who work in the French>English and Spanish>English workgroups, respectively) led the into-English session. To develop and tailor this session, participants were mailed a sample practice test to translate and given about 10 days to complete and return it. These tests were then graded applying the same criteria used for the actual certification exam. The purpose of this exercise was to target each participant’s common—and not so common—errors. The results were then discussed during the session, although any specific examples used were kept anonymous. The main benefit of this exercise for participants was that they were able to learn from comparing each other’s translations and discussing why one rendition worked and another didn’t. It allowed participants to gain a better understanding of where errors happen and identify if they are word-, sentence-, or passage-level errors. This analysis also allowed participants to see how errors impact the comprehension of the entire translated passage. There was plenty of back and forth discussion, including participants’ explanations of their choices and decisions. Each participant received his or her own marked-up practice test at the end of the workshop. Just like the morning session, the afternoon session began with an introductory talk with visual aids to provide a detailed explanation of the nature and expectations of the certification exam, the error categories and what they mean, and grading criteria and standards. Participants were introduced to the common criteria for grading into-English tests regardless of language pair. The Into-English Grading Standards (IEGS), which are available on ATA’s website, form an essential basis for grading all language pairs in which English is the target language. The concept of evaluating errors based on the extent to which they detract from the usefulness of the translation to a potential client was also covered. The discussion then switched to some of the essential characteristics of an effective translation, the principles for exam preparation, and test-taking skills. After this, participants were divided into two groups. Since a large proportion of the into-English group was composed of Spanish>English candidates who had taken the morning session, that group met separately to review the errors on the sample Spanish>English practice test that many of them had taken in preparation for the workshop. The second group was composed of candidates who work from a diverse set of languages into English. The presenters at this session were able to use materials that had been provided by several into-English certification workgroups to exemplify some of the challenges faced by candidates, including carrying over the linguistic organization of a text into a very different, sometimes unrelated, language. As was the case in the morning session, candidate participation was strong and enthusiastic. The workshop proved to be a success, based not only on the number of attendees (the workshop sold out), but also on the diversity of the participants: people from as far away as the West Coast, Texas, Florida, and even Venezuela attended. With its maritime view, the University of Massachusetts Boston proved to be an attractive venue, even in winter. We were fortunate that the weather was cooperative that day, as Boston was experiencing a particularly rough winter. Many people signed up for both sessions, and while the content of the morning and afternoon sessions was different, they built upon each other. Comments after both sessions were positive, as were most of the comments made in the post-event evaluations. As with any pilot program, some kinks need to be worked out. For example, one comment indicated that too much time had been spent on the administrative aspects of the testing and grading process, forcing presenters to rush through the more interesting part where passages were put under a magnifying glass and reviewed in detail. As a direct result of the evaluation comments, we prepared a video that explains many of the generic details regarding the exam and presented it at a subsequent workshop that took place as part of the “Spring Into Action” conference co-sponsored by ATA’s Spanish Language Division, the Association of Translators and Interpreters of Florida, and Florida International University. In this way we were able to devote the entire workshop to analyzing the candidates’ proposed translations. The event in Miami was not part of ATA’s Certification Program, but the changes implemented for the workshop demonstrate that the Association and its graders respond to membership feedback to make its programs as rewarding, informative, and fun as possible. ATA’s Certification Exam Preparation Workshop presented opportunities for participants to learn how the Certification Program works, including the general characteristics of the passages and how exams are evaluated and graded. In addition, participants were able to learn from the graders about the specific challenges found in exam passages and gain a better understanding of the common and individual mistakes that arise. Rudy Heller, an ATA-certified English>Spanish translator, has been a grader for ATA’s English>Spanish certification exam for over 12 years. He is a federally certified court interpreter and has been a professional translator for over 40 years. He is a former ATA director. Contact: rudyheller@gmail.com. Diego Mansilla, an ATA-certified English>Spanish translator, is a grader for ATA’s English>Spanish certification exam. He is the director of the Translation Program at the University of Massachusetts Boston, where he also teaches advanced courses in translation. He is a member of the board of directors of the New England Translators Association. His areas of research are translation pedagogy, collaboration in translation, and online education and assessment. Contact: diego.mansilla@umb.edu. ← What Exactly Is a Technical Freelance Translator? When and where will you be offering another workshop? Thanks!